Take a look at high level sport and the top teams often do not have much separating them physically. In the end it often comes down to the team with the mental edge. And just as athletes train their physical skills, they must also train their mental skills. 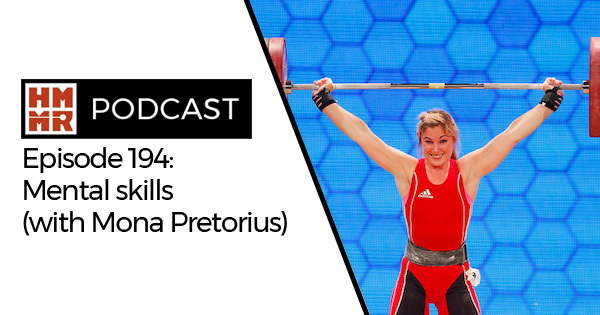 World class weightlifter Mona Pretorius has competed on the international stage in three sports and studied sports psychology. She joins us on this week’s podcast to talk about the mental side of sport and training mental skills. Mona Pretorius is a South African weightlifter and coach. In 2018 she won the African Championships and Commonwealth Games bronze mendal in the 63 kg event. She has competed internationally in weightlifting for more than a decade, and also was a six-time world karate champion and Crossfit Games competitor. As a student she also completed her masters in sports psychology. She is currently living in Romania where she trains towards to 2020 Olympics and helps coach athletes on both the physical and mental aspects of training. 11:00 – Weightlifting for youth athletes, dealing with pressure at a young age, and dabbling in Crossfit. 15:00 – Developing an interest in sports psychology. 24:30 – How sport coaches can help with mental skills. 27:00 – Mona’s plan for mental skills training before a competition. 40:30 – Nick’s experience and trends in mental skills we see with our athletes. 47:00 – Mental training after injuries. She also has written extensively on her site about mental skills. We can recommend her 4 Week Mental Skills Workbook. On her blog she has also written about anxiety, goal setting, and more.